AMC FPGA boards are MicroTCA-compliant. MicroTCA is complementary to the PICMG3.0 Advanced Telecommunications Computing Architecture (AdvancedTCA or PICMG3). 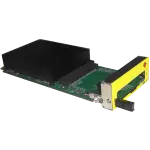 Where AdvancedTCA is optimized for very high capacity, high performance applications, MicroTCA is designed to address cost-sensitive and physically smaller applications with lower capacity, performance, and perhaps less stringent availability requirements. MicroTCA preserves many of the important philosophies of AdvancedTCA, including basic interconnect topologies and management structure. MicroTCA is a modular standard. By configuring highly diverse collections of AdvancedMCs in a MicroTCA Shelf, many different application architectures can be easily realized. The common elements defined by MicroTCA are capable of interconnecting these AdvancedMCs in many interesting ways—powering and managing them, all at high efficiency and low cost.